A stock conical spring catalogue is made when a spring company starts manufacturing different tapered spring designs and keeps them in stock or inventory. These standard conical springs are then put in a stock conical spring catalog where they are arranged by their specific part number and spring dimensions. 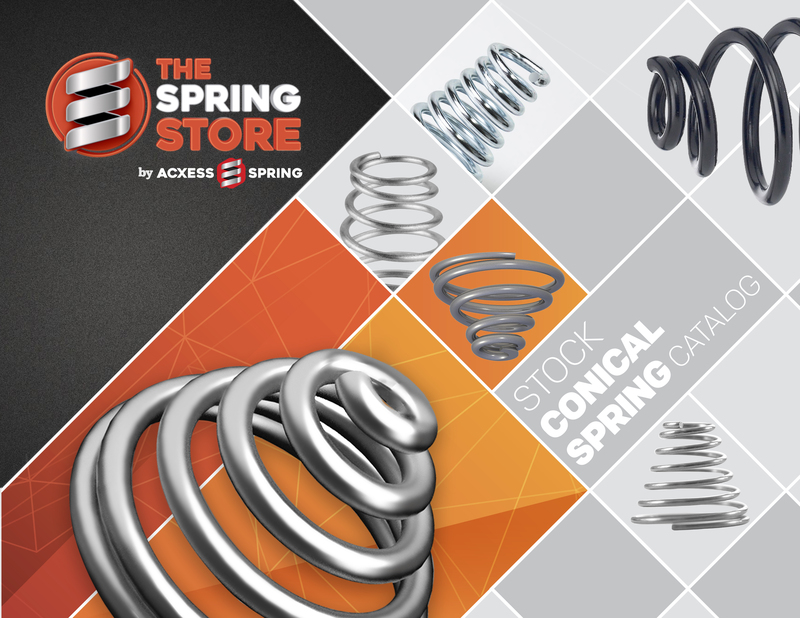 Buy your stock conical springs at Acxess Spring where we provide you with access to our new, online stock spring store: "The Spring Store.com". We have put our entire tapered spring catalog online with almost 400 different tapered spring designs in stock as well as compression, extension, torsion spring catalogs. You'll be surprised at the simplicity of this site since, with just a couple clicks, the stock tapered conical spring finder will search our database and find your stock tapered conical springs fast! From searching for your standard tapered springs to actually placing the order online for your stock tapered springs. It's easy to find your stock conical springs. With our standard conical spring finder, you may do a basic stock conical spring search by only inputting your tapered spring's large outer diameter or small outer diameter and free length. In case that you are more familiar with your spring design or have very tight tolerances, you may do an advanced search where you have the option to input either wire diameter, total coils, solid height, or rate. The Spring Store by Acxess Spring also allows you to download the full stock conical tapered spring catalog in PDF format.